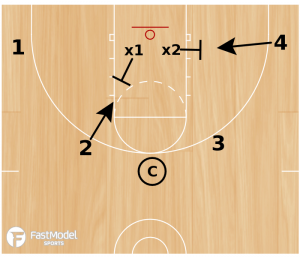 This shoting drill came from the FastModel Sports Basketball Plays and Drills Library. The drill was contributed by Kyle Gilreath, Head Boy’s Basketball Coach at Astronaut High School, Titusville, FL. Kyle is also the author of the basketball coaching website, Words on the Bounce. Coach Gilreath was a graduate manager for Billy Donovan at Florida and learned the drill from Coach Donovan. 1) The coach should shoot the ball to create a rebounding opportunity. 2) You can also run this with 3 or 4 players blocking out. 3) You can create two different teams and add a scoring system to make the drill competitive. 4) Another adjustment you can make is to have the players on the perimeter move so that the defenders who will be blocking out have to find them to block them out. Players are on the outside are all offensive players. Place two defenders in the paint. Coach calls out a number combo. For example: 24. X1 and X2 must block out 2 and 4.